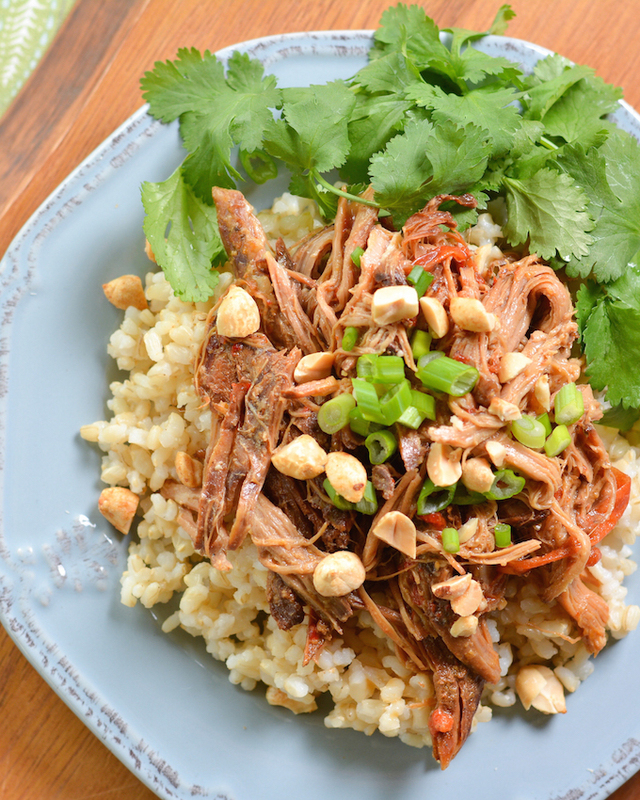 This Crock Pot Thai Pork with Peanut Sauce is packed with flavor and so easy to make. Just start the slow cooker in the morning and come home to a delicious dinner! Well, it’s been a crazy two weeks, to say the least. Since I haven’t quiiiiite finished my wedding recap yet, I figured I’d give you all a delicious recipe to tide you over! I made this pork before wedding madness even set in, but I’ve been thinking about it ever since. Nick proclaimed it one of the best things I’ve ever made, and I definitely agree it’s one of my favorites. But if you ask me, you can’t really go wrong with peanut butter or Thai. Place pork and peppers in the bottom of a slow cooker. In a bowl, combine teriyaki sauce, rice vinegar, red pepper flakes, and garlic. Pour over pork. 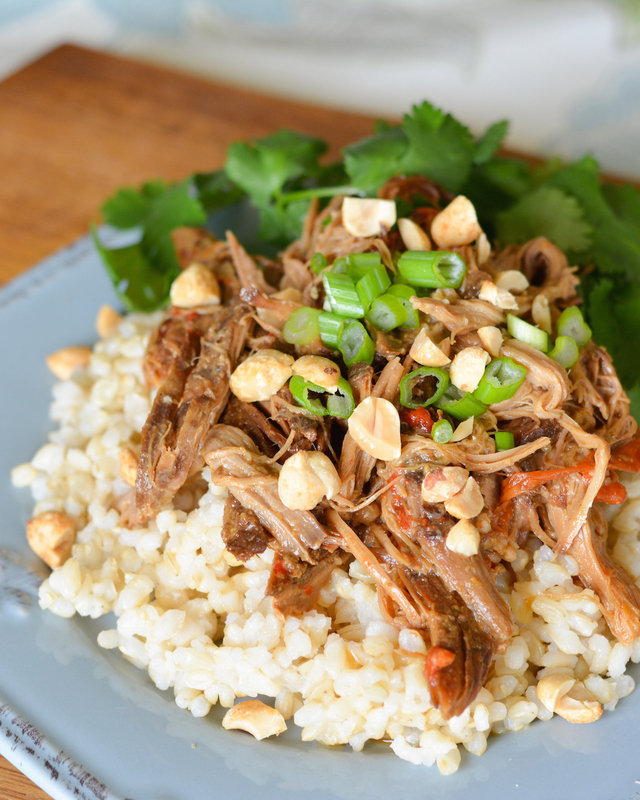 Carefully remove pork from slow cooker and shred. Mix peanut butter with sauce in slow cooker until peanut butter dissolves. Toss the pork back in slow cooker and coat with the sauce. 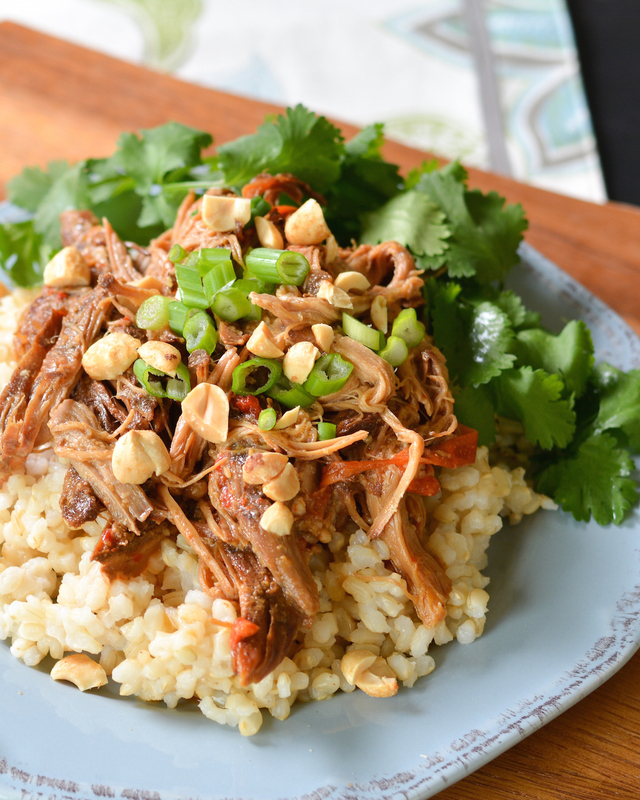 Serve over rice, topped with green onions, peanut, cilantro and sriracha! Note: Photos updated 3-8-16. Original photo below. I saw this at the hop and couldn’t help but click on it. Not only does it look delish, but as the weather gets cooler I’m looking for things to make in the crockpot. There’s just something so comforting about smelling a hot dinner cooking all afternoon on a cold day. Can’t wait to try this one. This looks great. 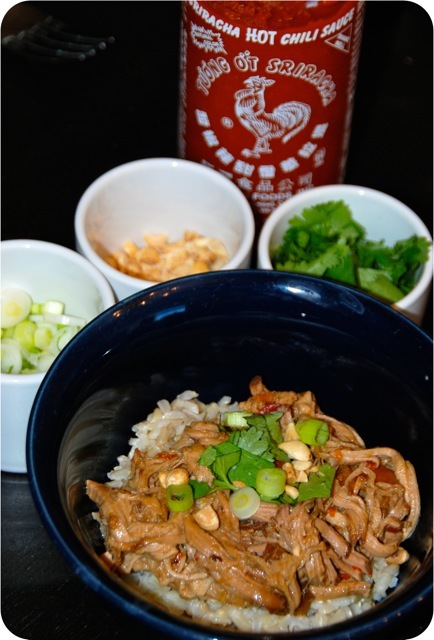 I am on such a peanut sauce kick and can’t seem to get enough recipes like this. I am definitely trying this one. I’ve been craving thai food and saw this on the pin it link up and had to check it out. I pinned it and plan to make it soon, it looks so yummy and easy! This is my kind of food! So many great flavors–it has to be delicious.